It’s Friday! That means just one more day until a much needed break from work for most of us. That’s great, but don’t Fridays always seem to drag on a lot longer than almost any other day? Today’s clock illusion really seems to sum up what Fridays are all about in my office. I’m just sitting here on Friday afternoon, watching the clock like…. I swear the clock moves backward some Fridays! Time just draaaags on. And it feels like I’m going to be sitting at work FOREVER. But, not too much longer! 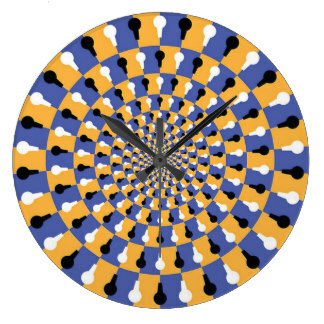 I need to stop staring at this clock illusion and just put my nose to the grindstone, and the weekend will be here before I know it! If you liked this clock illusion, check out this crazy spiral clock!